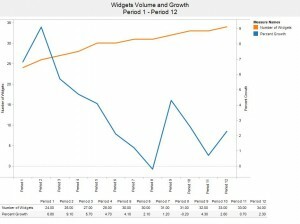 « Dual Axis Graphs: Are They Useful? That was way too much work to get the gist of this graph! Why was this so difficult to get? Instead of providing a scale, the individual data points are labeled – this clutters up the picture and distracts the eye. Not only that, it is difficult to get a ballpark idea for the maximum values unless one scans each data point – a scale for each data series would have provided that contextual information much more quickly. When I re-created the graph I realized something else: in order to display the line graph within the colored bars, I had to set the maximum value for the percentage scale higher than what would be expected: instead of setting the top percentage value to 10% I had to use 15% to push the line graph down far enough to completely overlap with the bars. Also, fewer words in the legend labels would have been better (the original had even more text!) – and it would have helped to spell out the word “percent” instead of hiding the percent symbol amongst all that text. Better yet: be consistent and stick with the same nomenclature: the chart title says “Volume and Growth” so the series labels should say the same. Maybe this is a nit pick, but I prefer legends at the bottom or the side of a graph. The top should be reserved for the title – IMHO. Percent Growth is going down. If the data values really matter to us, we can look them up in the table below the graph. as always, you make an excellent point – and it made me chuckle at myself for not catching that point when I wrote the post. Thanks for sharing the links. The main thing I do not like about dual axis charts that use different scales is when the lines cross, I have to remember that that point or crossing is meaningless, and trying to compare the magnitude of the lines to each other can also be misleading. If you goal is to show both an increase in count over time, but a small percent difference between each, then a dual axis of percent difference from first along with percent difference from previous would make more sense in my opinion. And if you wanted to see the detail of one, you could put them on separate axes.